Hercules is a new fantasy action film directed by Brett Ratner, not to be confused with Renny Harlin’s The Legend of Hercules movie that came out back in January. This time, we have Dwayne “The Rock” Johnson starring as the title character alongside John Hurt, Ian McShane and Joseph Fiennes in supporting roles. Obviously, Dwayne Johnson is a perfect fit for the part of Hercules and if you can’t tell from the picture above, The Rock looks absolutely huge for this movie. However, despite his major star power, I honestly wasn’t expecting much out of this action flick. But believe it or not, Hercules may very well be the surprise movie of the summer blockbuster season. The movie opens with a brief account of Hercules’ (Johnson) early life as a Greek demigod followed by a montage of his legendary twelve labors. Hercules achieves many physical feats in combat, which includes killing a lion with his bare hands. His battle heroics establish him as a legend and hero amongst the Greeks. However, years later after the loss of his family, Hercules decides to become a mercenary, traveling around Greece using his physical gifts and intimidation abilities in exchange for gold. Along the way, five more companions with similar interests join him and they form a powerful mercenary group. Eventually, the King of Thrace, Lord Cotys (John Hurt) hires Hercules and his partners to train his men in combat skills. He intends to create the greatest army of all time and rule with an iron fist. It is up to Hercules and his team to see past this tyranny and restore justice to Greece. To my surprise, I was actually extremely entertained for just about every minute of Hercules’ perfect hour and a half runtime. Dwayne Johnson totally owned the role of Hercules and completely stole every moment he was on screen. I imagine that anyone who has seen the movie would agree that watching him wreck havoc in battle was definitely the highlight of the film. Furthermore, all of the action scenes were thrilling and very well shot, although there were some aspects that felt like they were recycled from movies such as Gladiator, Braveheart and 300. 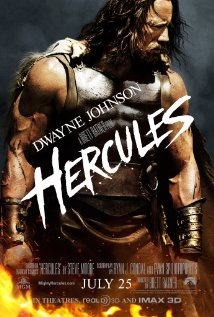 Putting aside that and very-much expected mediocre acting, I enjoyed pretty much everything else about Hercules. It was action packed and exciting from start to finish; a surprisingly entertaining summer action movie for sure.